The Art of Serious Game Design methodology helps teams with diverse experience in serious game design to engage in guided brainstorming using ideation cards that contain questions to be answered by the design team. You can download and print the ideation cards to be used in the workshop (please refer to Resource 2). Workshop participants work with two decks of cards, each representing the respective stages of brainstorming. Cards with a solid border are used for Brainstorming Part 1, and cards with a striped border are used for Brainstorming Part 2 (see Figure 4 below). 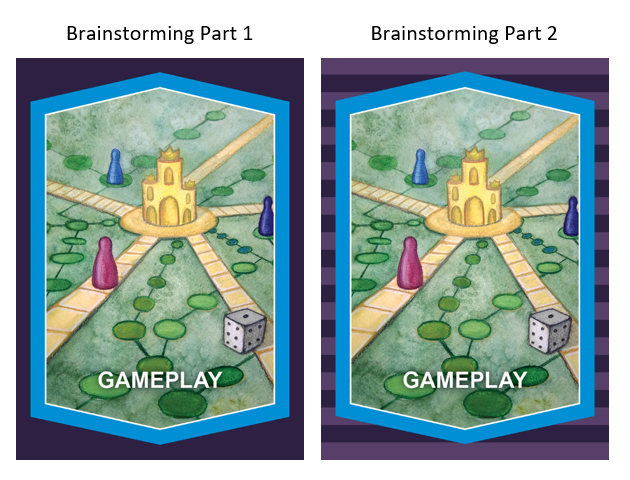 The titles and colours on the front of the cards match those of the four core elements of serious game design in the methodology circle (learning, storytelling, gameplay and user experience). Figure 4. Ideation cards for the gameplay element within The Art of Serious Game Design card deck. The workshop facilitator distributes The Art of Serious Game Design deck of cards for Brainstorming Part 1 (with solid borders) along with the accompanying glossary to the team of subject matter experts and instructional designers. The facilitator instructs the group to select one team member to take on the role of reading the card questions and another team member to record (scribe) the answers from the group. As the cards are drawn, each question is read out loud and the answers are discussed within the group. Once in agreement, the scribe writes the group’s response to the question on a sticky note whose colour corresponds to that of the quadrant of the methodology circle it represents (see Resource 2). The note is then placed on that quadrant, as shown in Figure 5 below. The goal of this session is for team members to answer as many of the questions as possible. Figure 5. 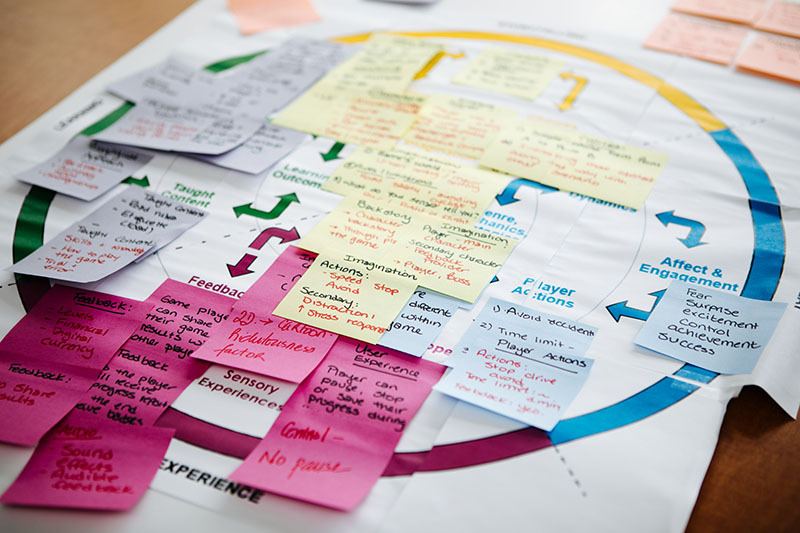 The methodology circle used to document the team’s brainstorming. If the team cannot answer the question(s) on a card, then the card can be placed at the bottom of the deck and another card can be drawn; the team can return to the unanswered card at a later time. Cards can be chosen randomly, and it is suggested that no more than two cards from the same category (element) are drawn in a row. After the team has answered the question(s) from a card, they can place it in a separate pile in order to avoid mixing them with unanswered cards. It’s important that the facilitator reminds the team to use the glossary (see Resource 1) to help establish a common understanding of the terminology (the bolded terms on the cards correspond to the glossary). They can also consult Bloom’s Taxonomy of Learning to help set learning outcomes. Following Brainstorming Part 1, game designers, developers and the rest of the team join the initial group to begin Brainstorming Part 2. The team of instructional designers and subject matter experts are asked to brief the new team members about the game ideas they came up with by talking them through the notes on the methodology circle. Facilitators should then provide the group with The Art of Serious Game Design deck of cards for Brainstorming Part 2 (cards with striped borders). As in Brainstorming Part 1, one team member could take on the role of card reader and another the scribe. As the cards are drawn, each question is read out loud and the answers are discussed within the group. The goal is to answer as many of the questions as possible. Once in agreement, the scribe writes the group’s response on a sticky note whose colour corresponds to the quadrant of the methodology circle that it represents. The note is then placed on that quadrant. If the team cannot answer the question(s) on a card, then this card can be placed at the bottom of the pile and another card can be drawn; the team can return to the unanswered card at a later time. Cards can be chosen randomly, and it is suggested that only two cards be drawn from the same category in a row. As the team answers the questions from each card, they can place those cards in a separate pile in order to avoid mixing them with unanswered cards. Teams may find that some of the questions on the Brainstorming Part 2 cards are similar to ones from the Brainstorming Part 1 cards. This is intentional, as it allows iteration to take place. Again, the team should be encouraged to use the glossary (see Resource 1) to help establish a common understanding of the terminology used in the card questions. After the brainstorming is complete, the team should discuss technological considerations for the game (see Resource 3 for a list of questions). This will further clarify what is realistic for the game in terms of budget and time, and will highlight technological limitations. It will also allow for additional iterations. In the final step, Paper Prototyping, the facilitator instructs the group to create a paper prototype of the game. One person can be selected to draw the prototype. Below are some examples of paper prototypes from previous workshops (see Figure 6). Figure 6. Examples of paper prototypes.